After having carried out a thorough site inspection, studied the possible solutions and realized a preview of the scenographic installation, we then proceed with the operations! Together with my team, we transform everyday ordinary spaces into magical and surprising places. At the base of all our projects there is the expression of creativity, art, harmony, balance and the attention we reserve to the needs of the bride and groom. Through the continuous search for new shapes, structures and materials we are always more and more able to tame the new techniques of floral design. With which we create original arrangements, floral gazebos, centerpieces, candlesticks, flower walls and all that the bride and groom could possibly dream of, always in perfect harmony with the rest of what has been chosen and the surrounding setting. 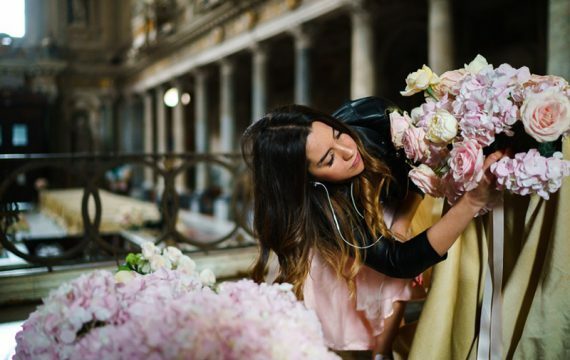 To give our utmost we work with the best floral companies that ship daily supplies of fresh flowers directly from Holland, whose quality and freshness is their strength and guarantee.